A.L.S. 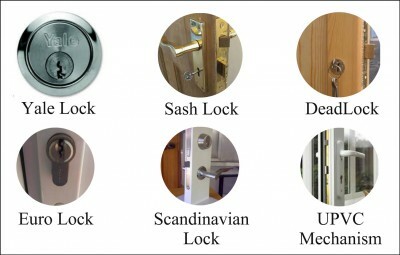 Glasgow locksmiths guide to door lock types. When we get calls asking for quotes to change or fit locks. We always ask our customers what types of door locks they have or want to have installed. So hopefully with this door lock types guide we have provided can clear the murky water in regards to door lock types and save a little time on trying to ascertain our customers requirements. Fitted to wooden doors. The barrel part comprises of a round rim cylinder. Most are branded, Union, Cisa, Yale, Asec, etc. If you require a lock change and new keys, this is the only part of the lock that needs replaced. On the reverse of the Yale lock type you’ll have either a traditional night latch (cheapest), modern night latch, Deadbolt type draw back, roller bolt, auto dead locking night-latch or BS3621 night latch. These types of door locks are fitted to wooden and aluminum doors. Comprises of a handle. Depress the handle to operate the latch and lock the dead bolt with a key. Can be either 3 lever (cheap lock) 5 lever or 5 lever BS3621 lock. You can Id this lock by the key hole and the length of the key. Sometimes the make of the lock is displayed on the key hole cover (escutcheon). If the door is open by looking at the side of the door the make of the lock should be displayed along with it’s lever rating. Usually fitted in a handle or round escutcheon on new build flats. On new type buildings and UPVC doors these door lock types are a common feature. The lock is above the handles and you have to engage the handles before locking. The mechanisms are pretty expensive but they are very secure and of top quality. The cylinder is oval in shape but comprises of 2 parts. An internal and external lock part. Unless you have a key turn internally both sides will have to be changed otherwise you’d need 2 keys to operate the door. The newer types comprise of 92 centers handles. Older types reflect in the size of the handles. For instance an old type fullex A will have handle centers of 68mm. By looking at the side of the door you’ll see different locking points be it rollers, mushrooms, deadbolts, hooks or wedges, or a combination of different types. The multipoint will be controlled via the key on a key wind version or the handles on a lever lever. Some types of door locks like the fast lock will lock just like a conventional Yale type lock. Confusing but easily identifiable. Click here to go back to our Lock Change page. Great little guide! Keep up the good work mate.